Lots of regular, educated people are incensed about the fact that Republicans reject man-made climate change. The biggest frustration is that their opinions seem immune to evidence, and yet the solution seems to be presenting even more. 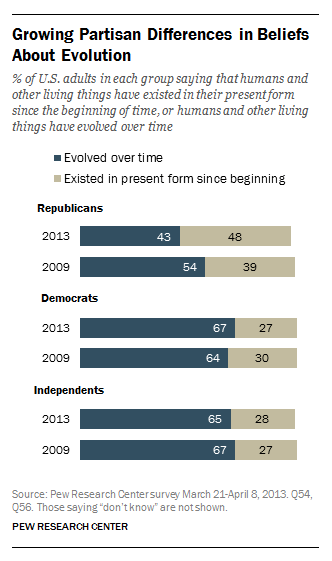 But there’s a precedent here that tells us everything we need to know: Republicans don’t even believe in evolution. Humans and other living things have existed in their present form since the beginning of time. I suspect those numbers are higher in 2017 than they were then. Climate science is hard. It’s complex. And frankly, scientists are not doing a good job at all of making their case in a clear and simple way. Evolution is the standard for rock-solid theories as judged by unbelievable amounts of evidence that continue to collaborate the only possible explanation for our observations. It’s simply obvious to anyone with an open mind and an education. But half of Republicans reject it. They’re not educated on the science (because they’re not open-minded). They know evolution is the liberal explanation, and they don’t want to agree with liberals because it means possibly endorsing their worldview as well. It goes against the Bible. Number 3 is a big one. There are tons of studies showing that people don’t accept evidence when the implications of accepting it would lead to policy they don’t want. Liberals have this problem with evidence that having more guns doesn’t necessarily lead to more gun violence. They reject these numbers because they don’t want more guns. Conservatives have this problem with evolution and climate change because they think a consensus will lead to changes in schools, more taxes, more government control, etc. The main point is this: if we can’t get half of Republicans to accept evolution—which is clear fact at this point—then there’s virtually zero chance of getting those same people to accept something with a worse narrative and far more political implications. Additional evidence is not effective in convincing people who have an idealogical reason to reject that evidence.